Walking | Notes from the U.K.
You can’t walk far in the U.K. without stubbing your toe on some bit of history. Today’s bruised toe comes from the Cornwall’s Coast Path between Tintagel and Trebarwith Strand, which Wild Thing and I walked last week, in beautiful, if windy, weather. 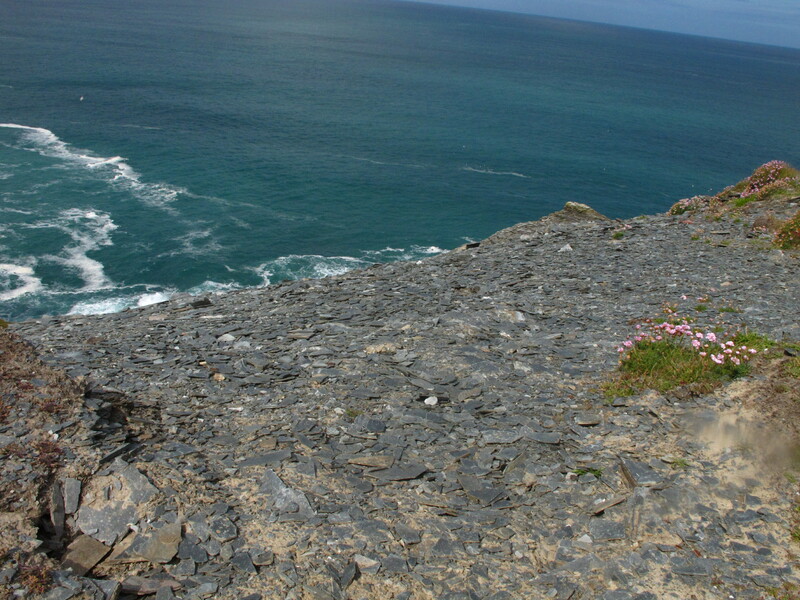 Cornwall’s traditional industries were tin mining, slate quarrying, and fishing. 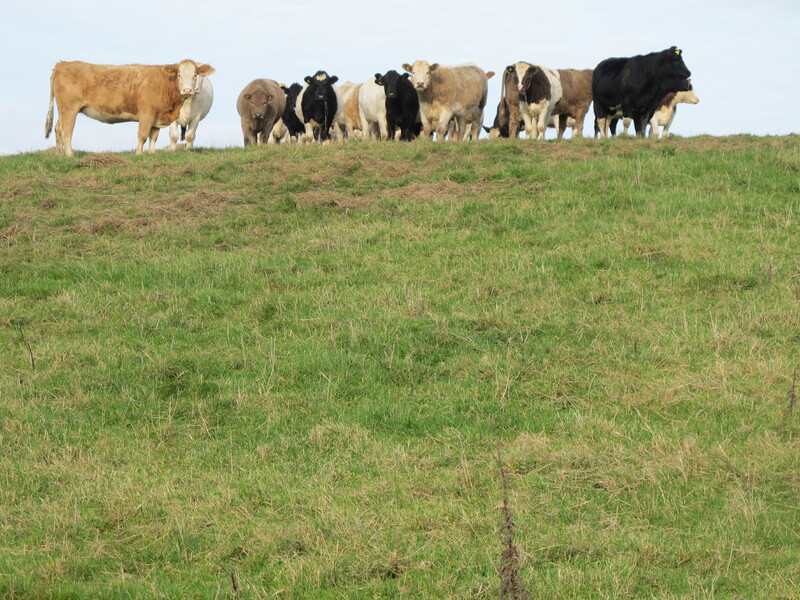 The soil here is rocky, so most of the farming involves grazing. Plowing this soil must’ve broken many a heart, not to mention a back. The tin mines were closed under Maggie Thatcher, and although every so often I read that one or another of them is going to reopen, so far none have. A few boats still fish commercially, but factory fishing has left the seas seriously depleted. And some of the slate quarries still operate, but the primary industry these days is tourism, leaving Cornwall with stunning views, low-wage, seasonal work, and high house prices. Sorry, I didn’t mean to brood. We’re taking a walk. The weather’s perfect. Smile, everyone. We’re starting at St. Materiana church, outside Tintagel. This is spoil from an abandoned quarry–the rock that wasn’t usable. The Coast Path goes right by it. Note the tilted horizon. That’s my doing. The real horizon is just where it belongs. Work in quarries like this must’ve been hellish at times, out on the cliff edge in the wind and driving rain. From what I’ve been told, young boys were sent over the clliff edges in baskets to blast the rock. They were lighter than grown men. It’s one thing to mourn a way of life that’s been lost, but let’s not romanticize it. With all that rock in and on the ground, the easiest method of dividing fields is building dry stone walls, and they’re everywhere in Cornwall. 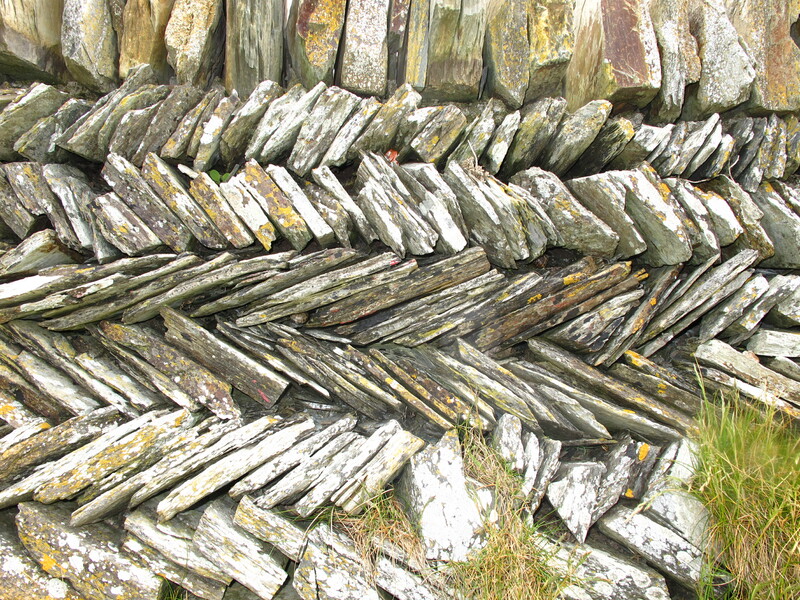 The dry in dry stone wall means not that you take them inside to keep them out of the rain but that they’re built without mortar–just stacked perfectly, stone on stone on stone. The way they’re built hasn’t changed over the centuries. I’ve read that the only way to tell the age of a wall is to count the varieties of blackberries growing in it. Blackberries grow wild here. If you’re not careful, they’ll take root in your bed, so change those sheets regularly, folks. The problem with the system is that I can’t tell one variety of blackberry from another. But never mind, because somebody can. And anyway, I’ve never yet needed to know a wall’s age. A dry stone wall. The pattern’s called curzyway in some places and jack and jill in others. A well-built wall can last for centuries. I took a one-day workshop on wall building and then built us a low one around a flower bed. The first stones fell out after a year, and I’ve been putting them back in place ever since. What did I expect from a one-day course? And it doesn’t matter. I’m proud of it anyway, in the way a seven-year-old is proud of an art project: not because it’s good but because it’s hers. The patterns of an area’s walls depend on the local rock. And yes, that’s obvious once someone says it but until someone does you don’t necessarily think of it. In other parts of the country, hedges serve the purpose that stone walls serve here. You work with what’s at hand. 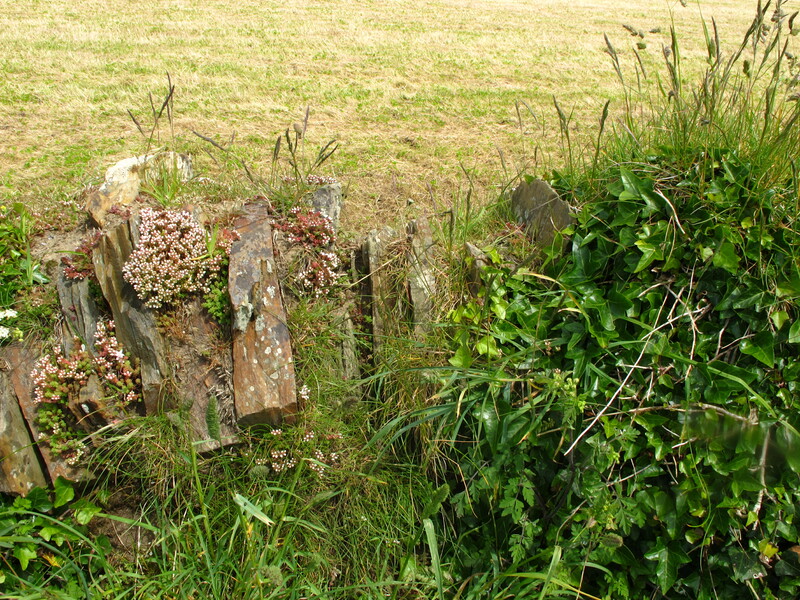 Not all of Cornwall’s stone walls are visible, because plants take root in between the stones and after a while can hide them completely. Roads often have what look like overgrown earthen banks on both sides, but inside that soft-looking mass may be a spine of stone. These days some walls are mortared but keep the look of dry stone walls. But back to our walk. We passed several abandoned quarries and skirted a series of fields, with their stone walls. 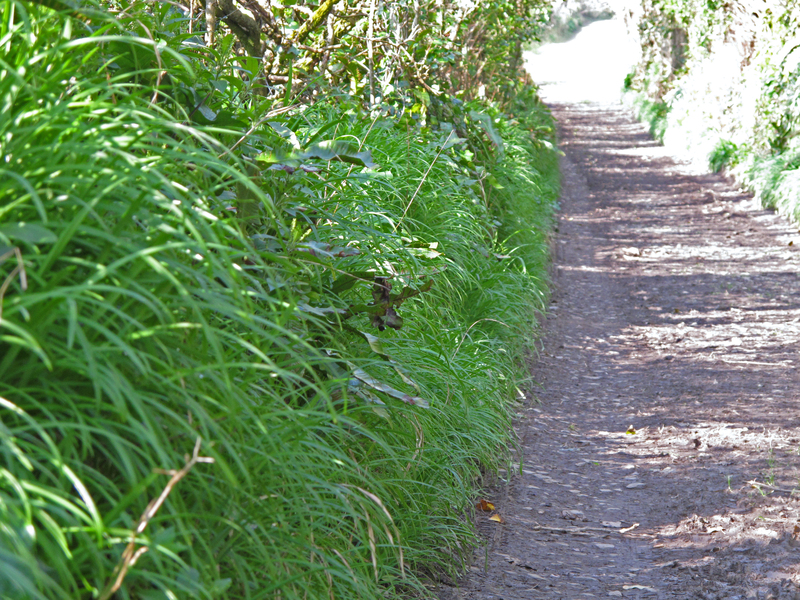 The Tintagel-Trebarwith path goes into only one field. I’l write about foot paths another time, but they cross private land–usually farm land. That too is history, and deserves its own post. This particular field often holds sheep, but it was empty last week, so I didn’t have to put the dog on a leash. When she was young and impressionable, she looked in the mirror and thought she saw a collie–or what the rest of the world calls a border collie; a sheep-herding dog–and she’s been trying to chase sheep ever since. The farmers do not find this cute. A stile. With the dog who thinks she’s a collie. No, we’re not talking fashion. You don’t want me to talk about fashion. Remember the mankini? This is stile as in “he found a crooked sixpence upon a crooked stile.” For some reason, American kids end up learning that nursery rhyme–or at least I did–in spite of not living within a thousand of miles of a stile. I used to wonder what one was. They’re ways for a wall to let people but not animals get over. Simple, timeless, and clever. 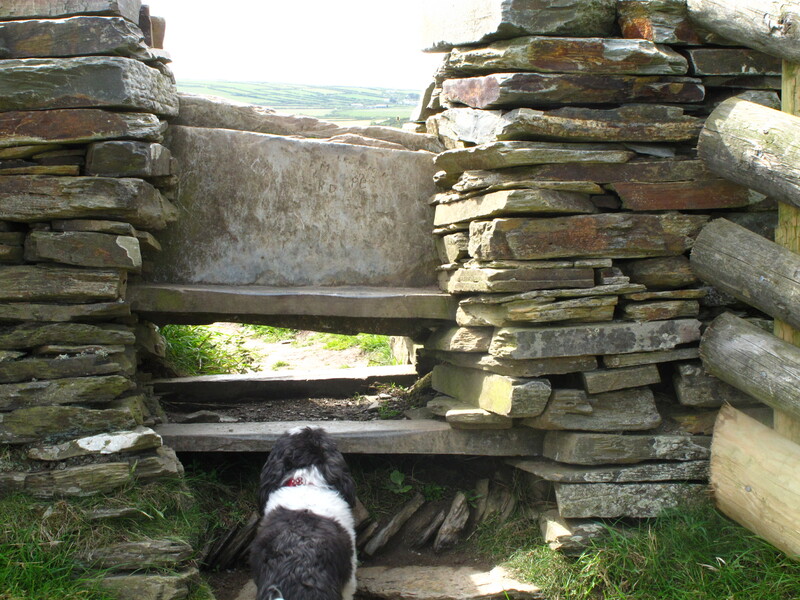 The (I can’t help myself) style of stile varies from place to place. This one let us into the field and has a space underneath that a small-to-medium-size dog can crawl through, as Minnie the Moocher is demonstrating in the photo. In places, paths go through field gates instead of stiles, and most walkers have the sense to close them, but there’s always one, isn’t there? Stiles solve that problem. The walkers get over and the sheep–or cows, or whatever–stay inside. You don’t have to open them and you can’t forget to close them. All you have to do is be able to climb over. Spring and early summer are the best times for wildflowers. 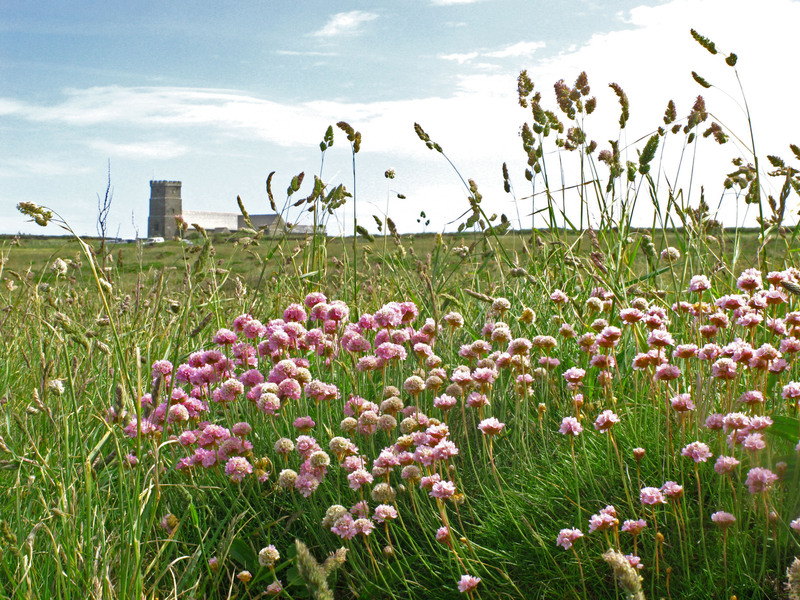 When I first came to Cornwall, I was overwhelmed by the numbers. After Minnesota, it all seemed unbelievably rich. 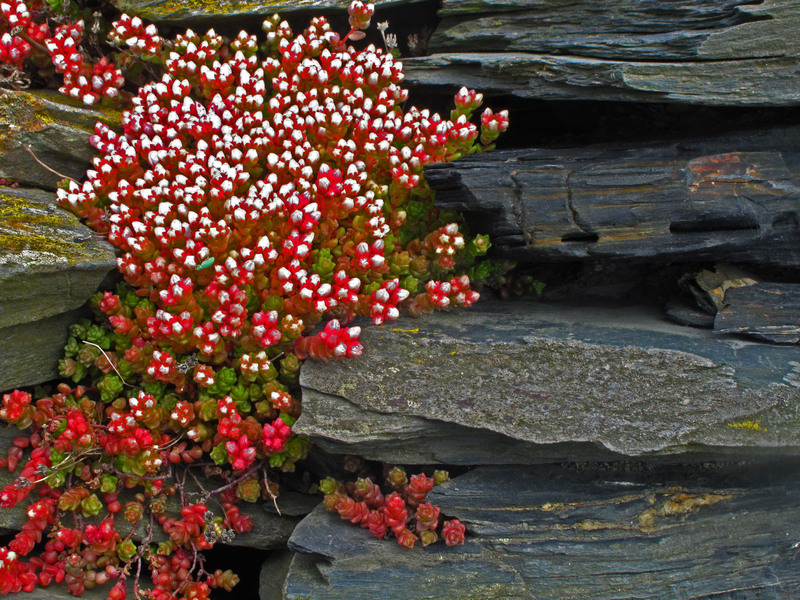 The stonecrop on the right is probably English stonecrop, but I’m not great at identifying wildflowers. If I can identify the family reasonably accurately, I’m happy. I haven’t even taken a guess on the speedwell. It could be field, slender, American, thyme-leaved, wall, heath, pixilated, pontificated, confabulated, etc. The list is as long as my finger, in small type. And yes, I did make up a few of those. After following the cliffs, the path descends into Trebarwith Strand, which is now given over to what everybody but me calls holidaymakers, who are drawn by the wide sand beach that appears at low tide. I’m not sure what called the village into existence originally. I doubt it was fishing, because the beach is covered at high tide and there’s no harbor at all. And it wouldn’t have been farming, because the valley’s too steep for any fields. Possibly the slate quarries. There’s another, also abandoned, in the valley just to the southwest. Today it has a cafe, a few shops, a pub, and a lot of holiday rentals. It’s a great place to get a cup of tea before heading inland to take the short route back to the car, which is what we did. On the road, we passed one more bit of history. 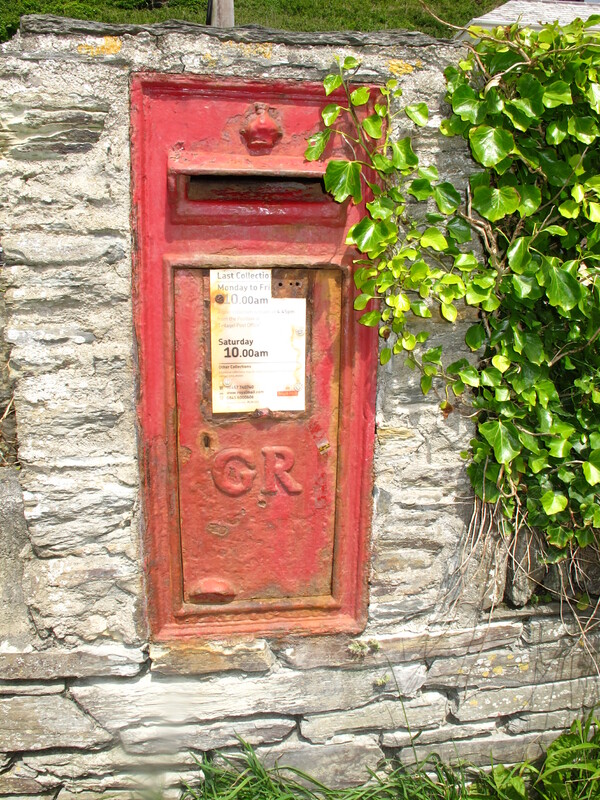 If you look carefully, you’ll see GR on the front of the mailbox. That shows who was king or queen when the box was put into the wall. In this case, it was George. We met a guy who collects them, by which he means not the mailboxes themselves, just the sight of them. Before we met him, we’d never noticed the initials. Now we look. Spring is what people used to call the hungry gap–the time of year when the food they’d by for the winter was running low and the crops were nowhere near ready to pick. So–I’ve been told–people around here turned to the hedgerows and picked what they could. 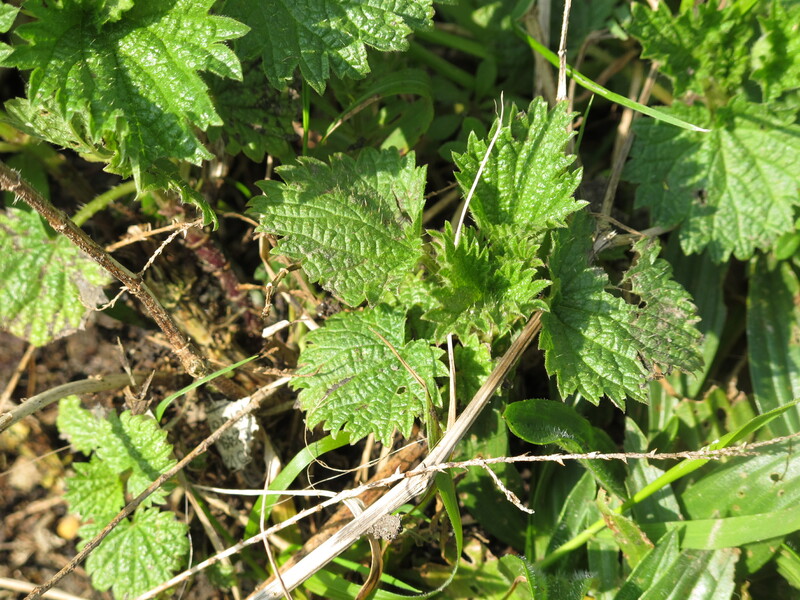 These are nettles–horrible itchy things but they loose their itchiness and are edible as soon as you steam or boil them. You can use them pretty much like spinach, but you have to be careful how you pick them. 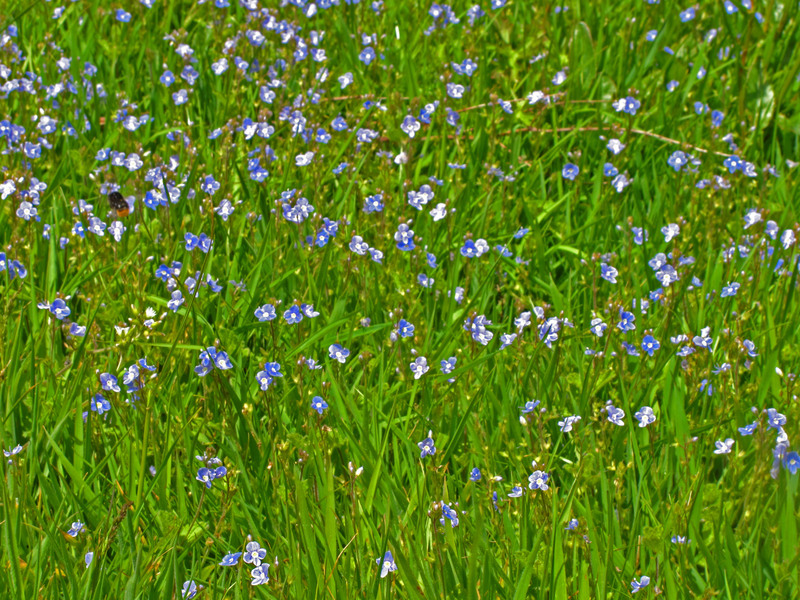 The grassy-looking things are three-cornered leeks. They smell more oniony than garlicky, but all the same I can’t walk past them without wanting a pizza. Good in a salad, or tossed into a pasta sauce at the last minute. 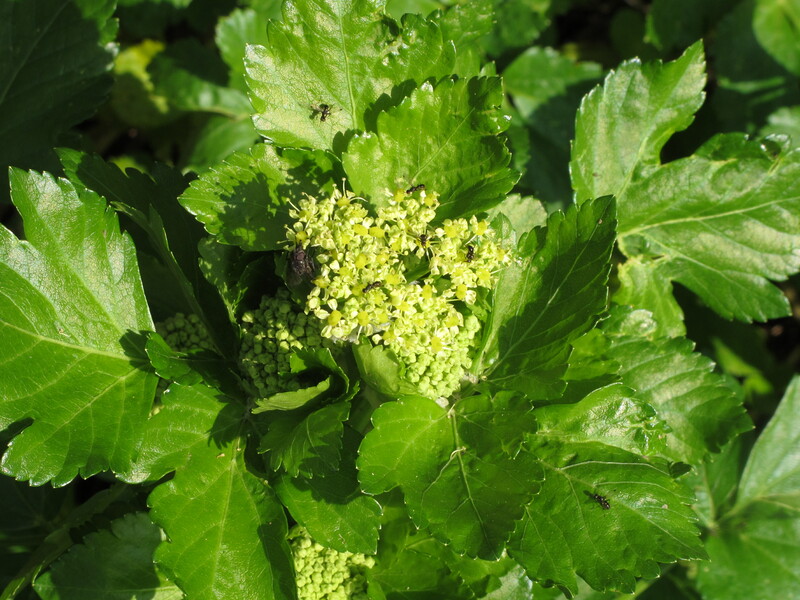 G. tells me this is the ancestor of celery–alexanders. They were brought over by the Romans (or so I’m told; I haven’t been able to confirm that). I’ve never cooked with them but G. has, and he lived to say they’re good. The seed, root, and flower are all edible. And finally, one not to eat. 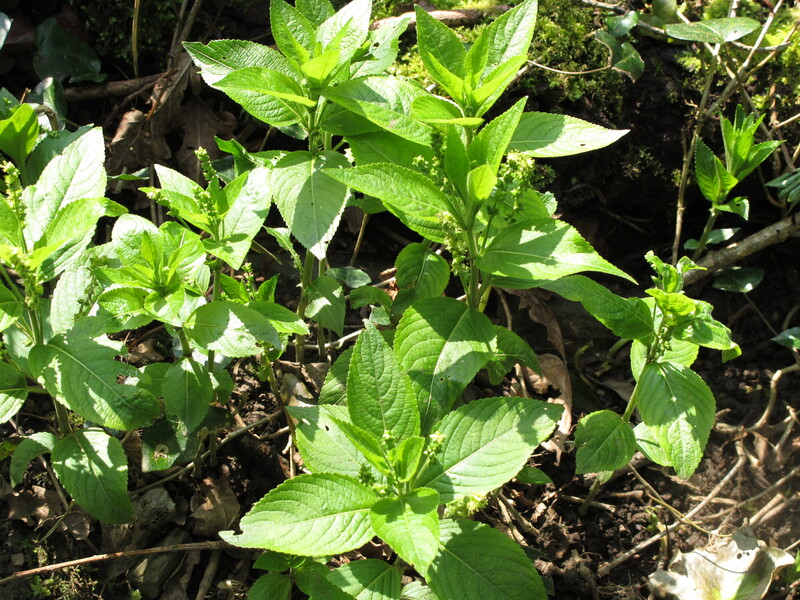 This is dog’s mercury. M.’s dog eats it, if she can, every spring. She eats it, then she throws up. That’s a dog’s idea of a fun day out. It’s toxic in large doses. The “dog” in the name means the plant isn’t useful. Except to M.’s dog. On Sunday, I joined the Parish Plod, an event whose aim was to make sure every footpath in the parish was walked in a single day. It’s not a traditional event, but I’m guessing it could turn into one. 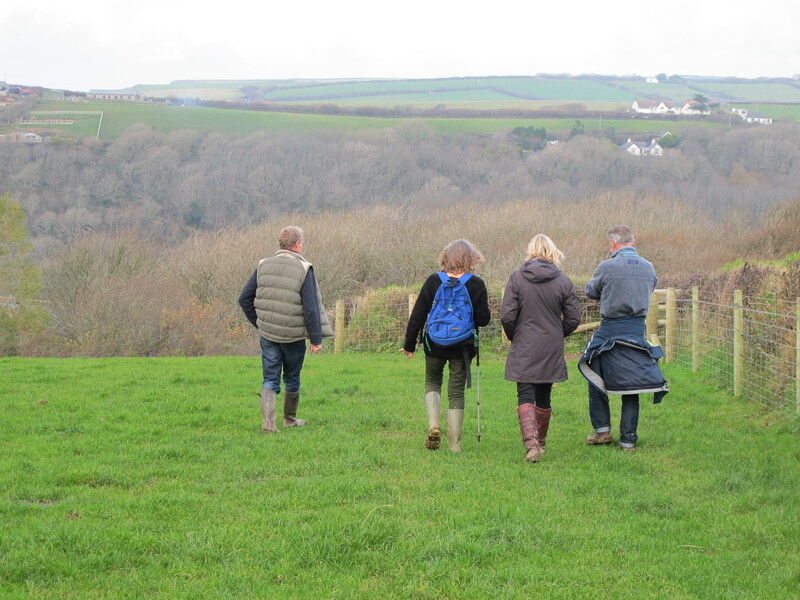 We broke into five groups, followed our assigned footpaths, reported back on work they needed, and drank caffeine at one of the beach cafes (and one lucky group stopped at Wooda Farm, a midway point on their route, for homemade cake). Eventually, as so many things do, it ended at the pub, at least for some of the walkers. These footpaths are protected public rights of way, giving walkers the right to cross private land. They take you across fields, through herds of cattle and sheep, through mud that comes up to your ankles and fights for your boots, along the cliffs by the coast, and sometimes through a farmyard or past someone’s front windows. Some landowners hate them, but if you buy a house with a footpath, then you own a house with a footpath. It’s like owning a house next to a road: You don’t get to move the road just because you’re not crazy about the traffic. In 2004, Madonna butted heads with the laws governing footpaths after she bought a modest little mansion whose land included a footpath, and she came away with a bruised forehead when she tried to close it. She did win the right to limit people’s access to parts of her land, but ramblers (as dedicated hikers are called) kept the right to cross it. Cattle making sure we left their field as we found it. Many of the old footpaths have been lost, so the ones left in our parish don’t entirely link up, but the ones that are left are a real asset, loved by both tourists and local residents. The group I went with got back to the café first (we had the shortest route), declared ourselves the winners, and waited for everyone else to straggle in. I brought the dog down to the stream and washed the mud off her, then we came back equally wet and cold, so at least I hadn’t done anything to her that I hadn’t done to myself. I’ll be surprised if we don’t do it again next year.